* I was sent Nordic Ware items for this review. All opinions in this post are my own. I love to bake! I have been baking cookies since I was a teenager and truly love it. I now love to bake cakes and cookies for my own family. My son is old enough to help measure ingredients and stir the ingredients in a bowl, he is always eager to help with baking. I enjoy the whole process of baking from the bowls I stir in, the freshness of ingredients and the bake ware. I even have a few favorite items. My favorite pan for baking has been a bundt cake pan but I have been wanting to have something different and special for the cakes I bake. I have been using Nordic Ware cooking items for many years. I like that they are durable, made in the U.S.A. and BPA-free and melamine-free materials in their products. I recently had the opportunity to try a few new products from Nordic Ware and I am now obsessed with the Bundt Square Pan. It makes the most beautiful square bundt with geometric patterns. I have set aside my round bundt cake pan for now and I will be using this pan for many of my holiday baking creations to come. 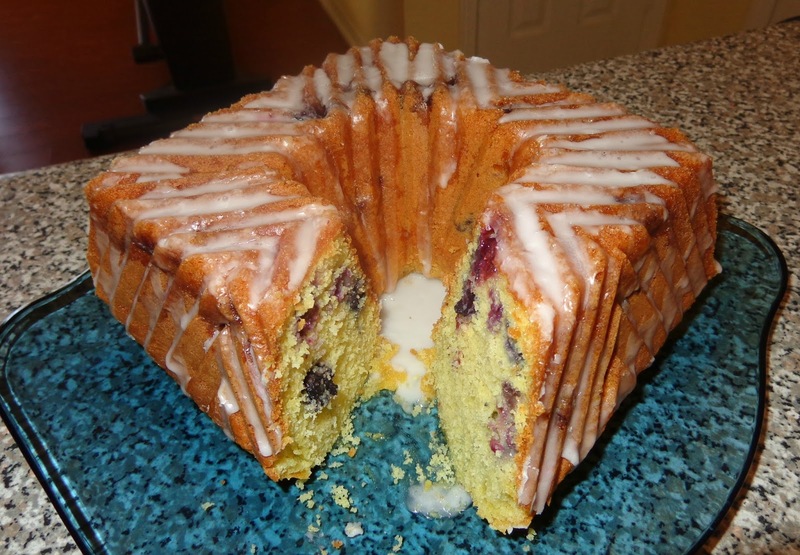 I baked a lemon blueberry cake for my first time using the Square Bundt Pan and I was wowed! 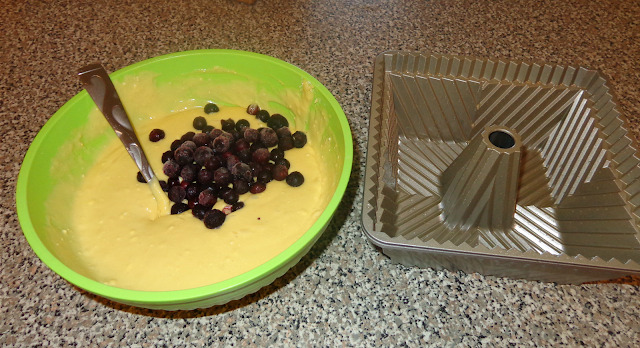 The cake came out easily since I followed the directions of putting oil and flour on the pan. It made a beautiful golden crust and the peaks and valleys made from the pan perfectly held the lemon glazing icing I made. There is something about a pretty cake makes me want to share it and eat more of it. Be sure to tap the bottom of the pan a few times on the counter top before placing in the oven to get out any air bubbles. Allow for 10 minutes for cake to cool once it is done to ensure the cake does not tear, do not wait longer than that to remove cake or the sugars solidify and will make cake stuck in the pan. For my recipe I used a premade lemon cake mix adding in lemon juice and blueberries. I made my favorite lemon glaze recipe from Martha Stewart website with 2 cups of confectioners sugar and 4 tablespoons of freshly squeezed lemon juice. The glaze should thick yet pourable. It tastes amazing on the cake. I also love to roast veggies and make oven baked fries making the new Natural Prism bake ware perfect for me. The herringbone grid pattern of the baking sheet allows for proper air flow to make your food crispier and easier release from the sheet. 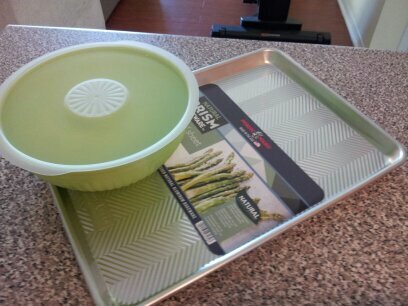 The rim of the sheet pan is galvanized steel making it resistant to warping during baking. The pans are non stick made of natural uncoated aluminum like pastry chefs all over the world use. Next on my list to try on the prism bake sheet is my favorite chocolate chip cookie recipe. I was sent some of the new Prep and Serve bowls. They are microwavable with slip free bottoms and BPA free. I love the fun lively colors they add to my baking experience. They are great for making and serving cold pasta salads and fruit salads too. 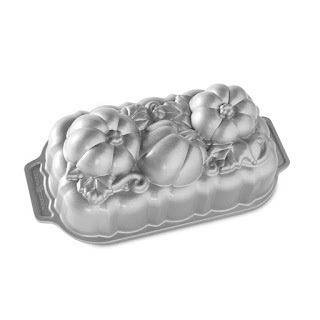 I have my eye on another baking pan by Nordic Ware, the Botanical Pumpkin Loaf Pan. It would be perfect for the fall season. To see more of Nordic Ware items and learn more about the family owned American based company you can follow them on Facebook, Twitter, Pinterest and Instagram.